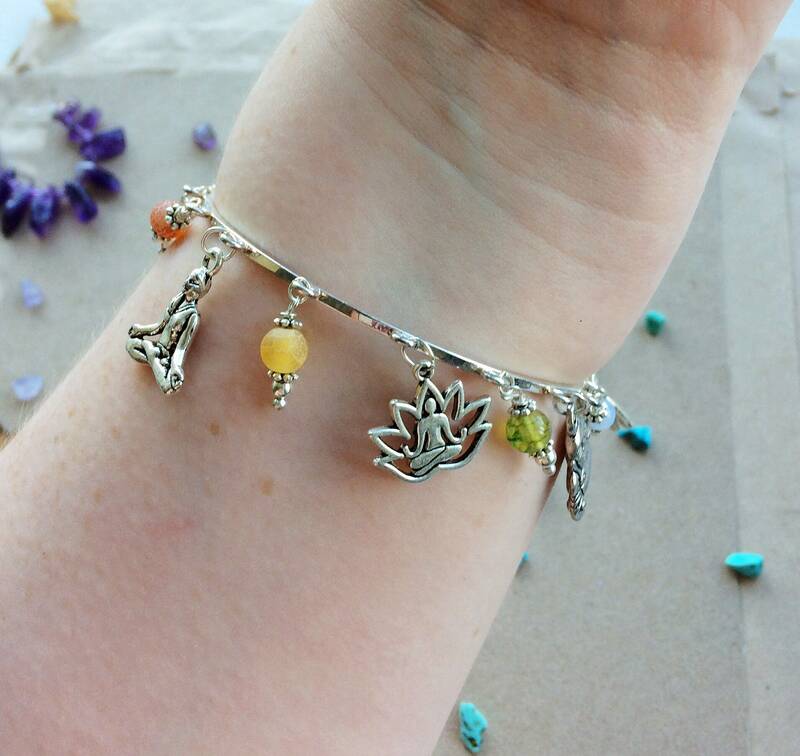 I have recently made another three yoga/meditation bracelets after the first was popular. 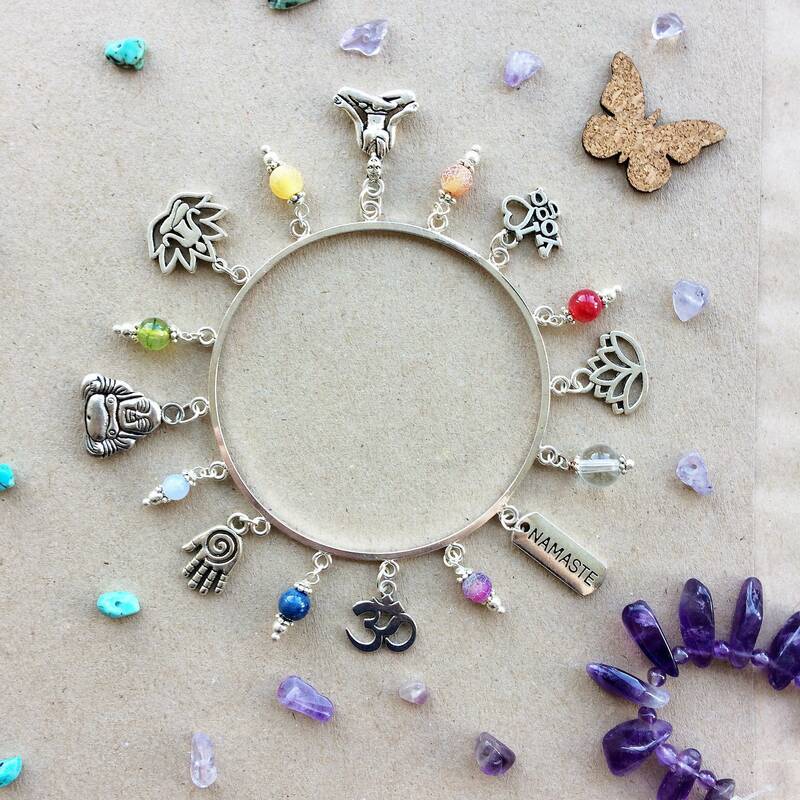 I made these bracelets to bring together gemstones with eclectic charms on the same theme. 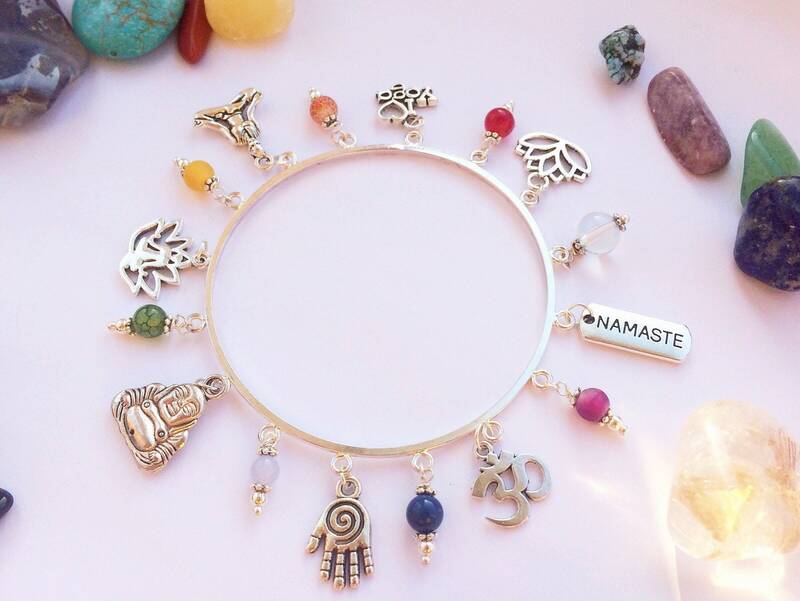 The silver plated charm bangle features charms including hansa hand with spiral,meditating figure in lotus, meditating crossed legged female, om scared symbol, Buddha, 'I love yoga' charm, 'NAMASTE' charm and lotus . 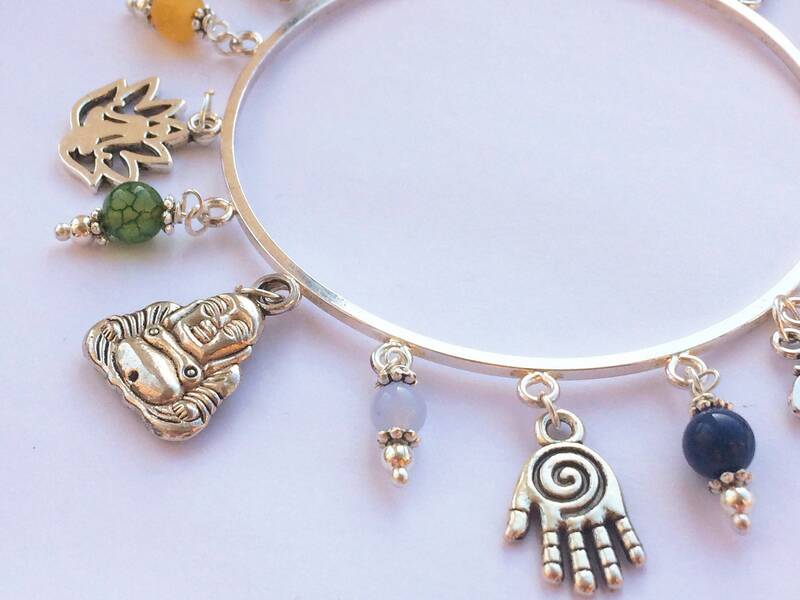 The diameter of this bangle is 6.3cm and it is made from silver plated metal. Red: Root Chakra. Connects us to Mother Earth, grounds us. Orange: Central Chakra. Communicates with the soul inside your body. Yellow: Solar Plexus. 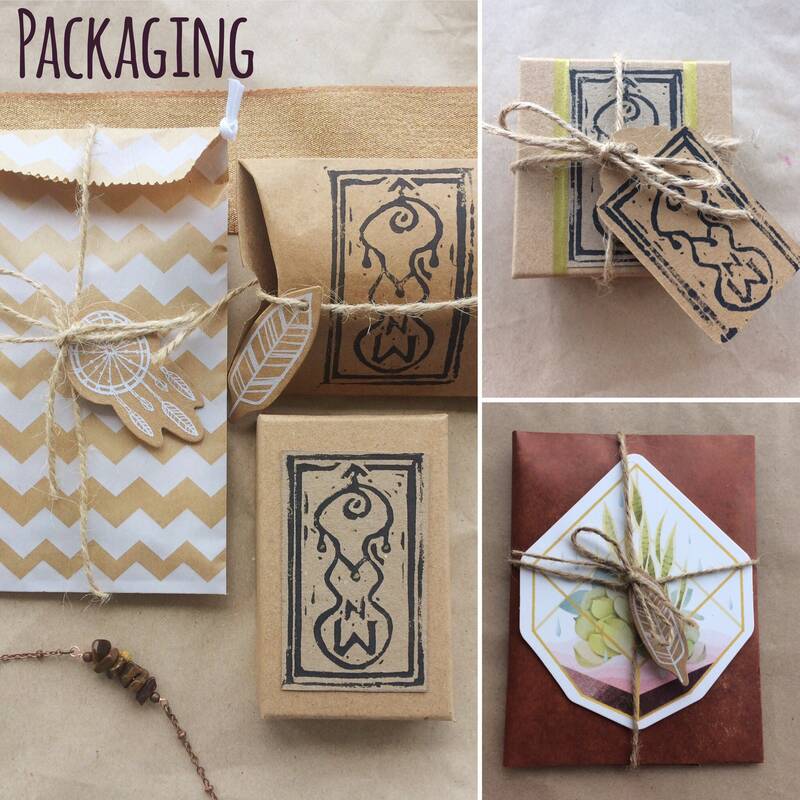 Provides for the structure of one's personality and helps us to interpret love. Green: Heart Chakra: Influences our relationships and sense of touch. Light Blue: Throat Chakra. Refers to our true voice, expression and communication. Indigo/Dark Blue: Brow Chakra. "The centre of knowing or monitoring”. Purple: Crown Chakra. 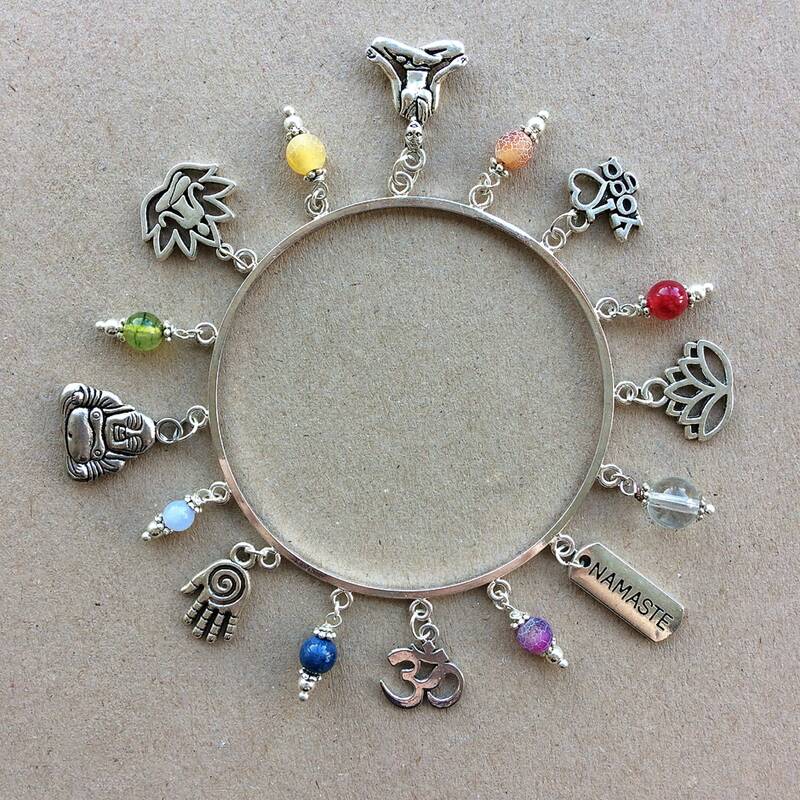 Representing cosmic awareness and cosmic consciousness. 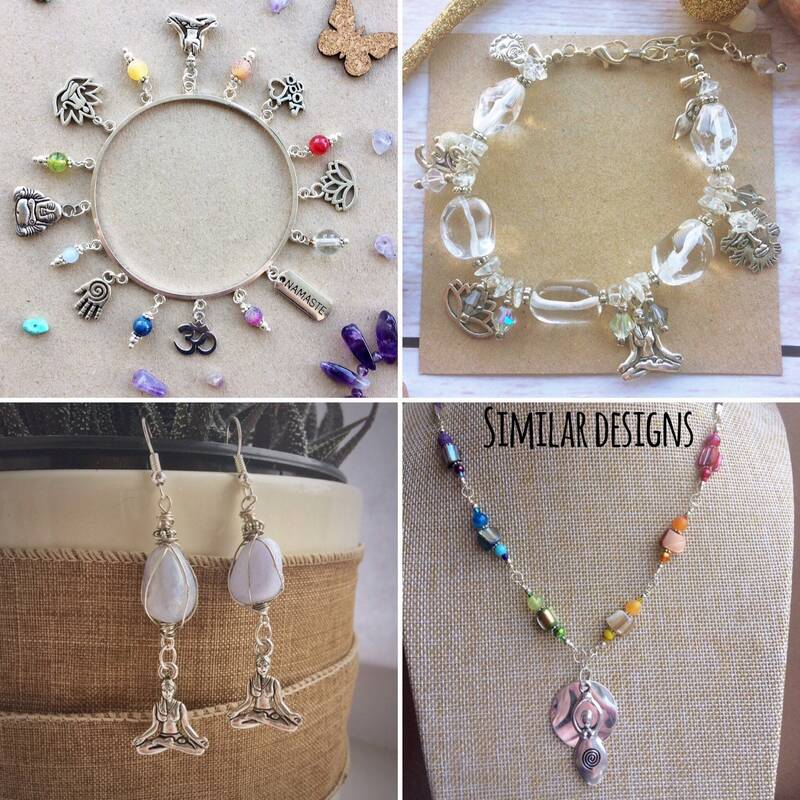 Crystal quartz: Also called rock or clear quartz, crystal quartz is known as the "master healer". It absorbs, stores, releases and regulates energy, and in particular clear quartz draws off negative energy of all kinds. 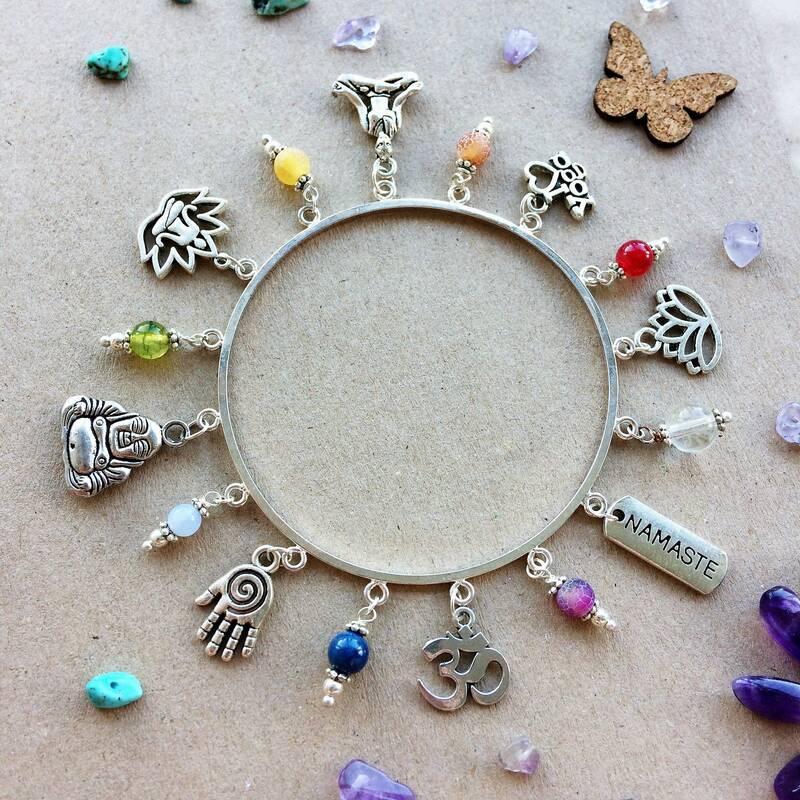 It cleanses the mind, balancing and revitalising the physical, mental, emotional and spiritual planes. 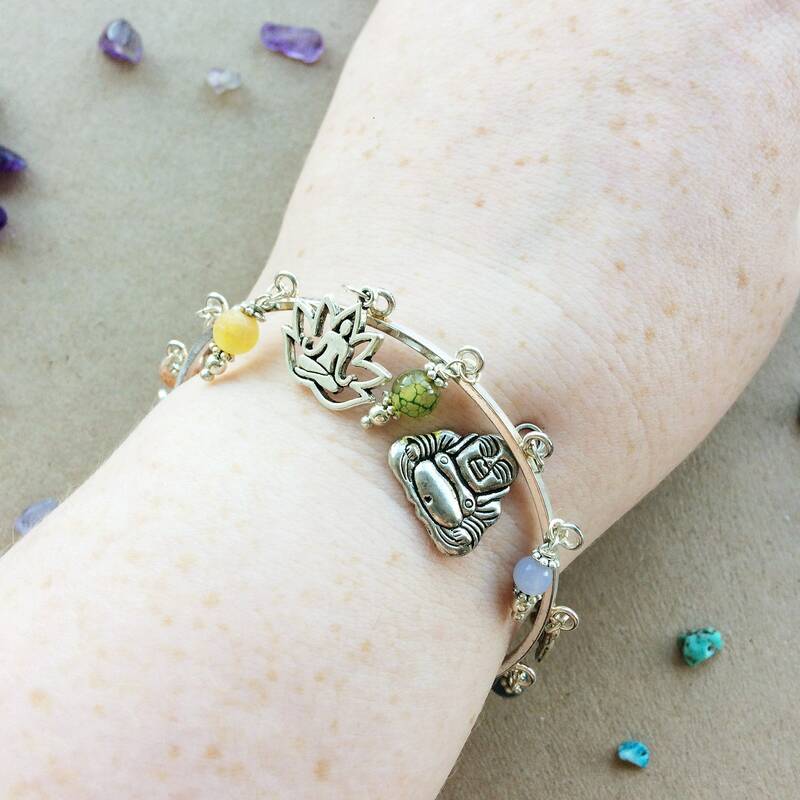 I was really excited to make these meditation bracelets, as the healing properties of gemstones really interests and attracts me. I love working with them and feel the benefit of having them around. 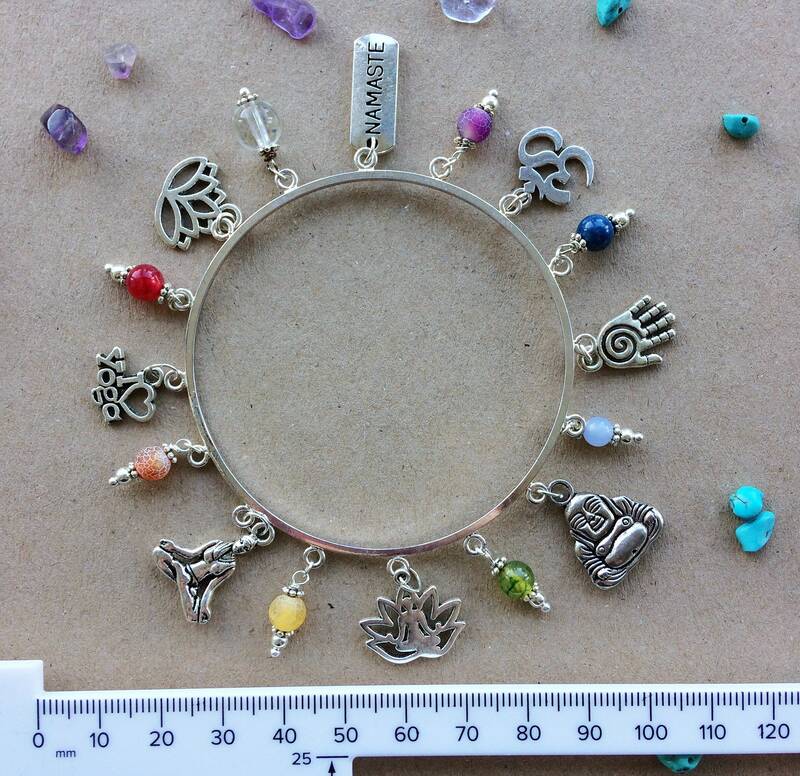 I am planning more jewellery on the theme of yoga/meditation and then several bracelets with a variety of mood boosting/well-being gemstones, which is really exciting! Please get in touch if you have a commission or ideas. I'm really open to collaboration and working with people to create unique and meaningful pieces. Thank you!